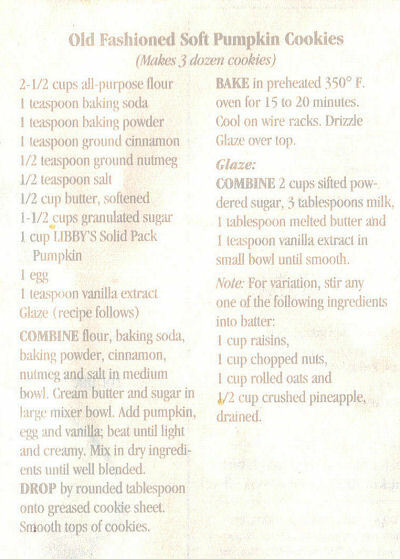 This promo recipe was clipped from a label of canned Libby’s Pumpkin and found in a large collection, date unknown. I’ve typed it below along with a scanned copy. COMBINE flour, baking soda, baking powder, cinnamon, nutmeg and salt in medium bowl. Cream butter and sugar in large mixer bowl. Add pumpkin, egg and vanilla; beat until light and creamy. Mix in dry ingredients until well blended. DROP by rounded tablespoon onto greased cookie sheet. Smooth tops of cookies. BAKE in preheated 350° F. oven for 15 to 20 minutes. Cool on wire racks. Drizzle Glaze over top. Thank you so much for passing along this wonderful old recipe. A true baker to archive recipes and share them. Again thank you.